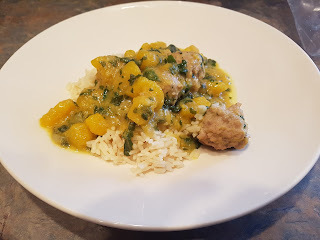 I had a beautiful kabocha squash to use up and I didn't want to bake or steam it, so I thought instead I'd make a curry with it. 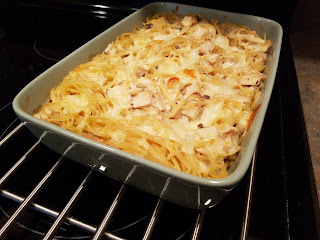 My original plan had been to keep it vegetarian, but then I decided to throw in some turkey for the kids - although really it was just for The Boy - The Girl is practically a vegetarian. She does not like meat much at all - so I made some quick meatballs and tossed them in too. The Girl didn't care for this and The Boy only wanted to eat the rice and meatballs but The Mister and I really really liked it. Heat the oil in a pan over medium heat. Add the diced onion and cook until softening. Stir in the grated ginger and the curry paste and cook, stirring, for 3 minutes. Add the squash to the pan and cook for a few minutes more. Pour the coconut milk and broth or water in, and add the soy sauce and sugar to taste. Bring to a gentle simmer over medium low heat, and cover while you make your meatballs. Remove the lid and gently drop the raw meatballs into the sauce. Cover the pan and cook, stirring occasionally, until the meatballs are cooked through and the squash is tender.